Are you looking for a unique gift for that special occasion? Purchasing a BC Bed & Breakfast Innkeepers Guild gift certificate is a great way to celebrate an anniversary, a birthday, a graduation, a retirement, your first marathon, getting your book published, setting up your new business, or a break from the kids. Enjoy a relaxing environment, a little pampering, and delicious food as part of your lodging experience during your time in British Columbia, Canada. BC Innkeepers gift certificates are available in any denomination of your choice They maintain full value and do not expire. 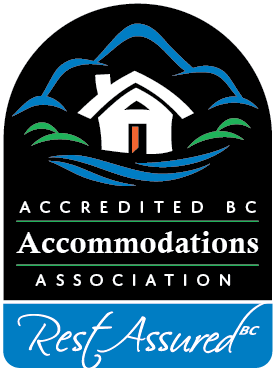 Gift certificates are redeemable for lodging at ANY BC Innkeepers’ member properties. Gift certificates may be transferred to someone else, but cannot be replaced if lost or destroyed, so keep them in a safe location. You can personalize your gift certificate with your specific comments or congratulations. Your order will normally be processed within 48 hours and you will receive an e-mail confirmation of your order after your online purchase. A shipping and handling charge of $10 applies for shipping anywhere in North America via regular mail service. Your gift certificate will include a copy of our current brochure so your recipients can find that Bed & Breakfast that will most suit their taste and meet their requirements. All they will need to do then is make a reservation, enjoy, and “Rest Assured BC”!